Today we have a great post from another one of our knit ladies! Meg from Made by Meg is going to show you how to make a peplum tshirt out of ponte knit. Ponte knit is a heavier knit that holds shape well and still has some stretch. It is perfect for tshirts, fitted dresses, fitted pants, and pencil skirts. In real life, Meg is a nerd in the non-profit world, but she sews and knits because, as she says, you can't wear a thesis! She's working on filling out a handmade wardrobe, and blogs about her sewing adventures at Made by Meg. 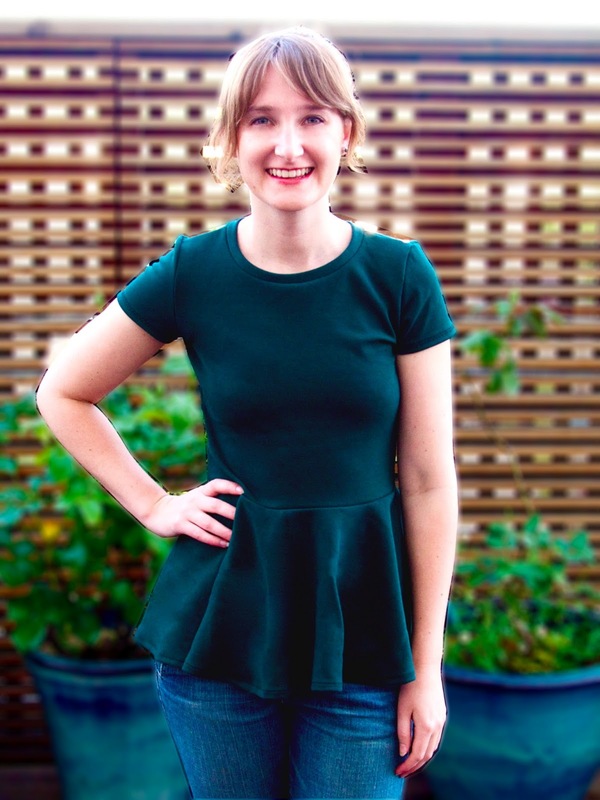 I didn't jump on the peplum bandwagon right away, but once I made my first simple knit peplum top, I was in love! The peplum adds style and sophistication to what is otherwise a comfy t-shirt, which is something I can rock all day long! If you're thinking you might want to try your own, you're in luck! Today with the help of the Fabric Mart Fabricistas, I am bringing you a simple-to-follow tutorial on how to make your own using a t-shirt pattern from your stash and a self-drafted circle skirt that can be made in two hours. And what's better than a free tutorial? Discount fabric! Head on over to the shop and get yourself 40% off on all their knits! But hurry! Their fabric goes fast! If you're new to knits, don't worry! Believe it or not, one of the first garments I made was from a knit. In some ways, it's actually the perfect fabric for beginners: no buttons or zippers, no frayed ends and, best of all, knit garments are easy to fit. However, as you may well know, the reason many people shy away from knits is because that same stretch that makes it so easy to wear can also makes it difficult to sew: my straight stitches popped, my hems were wonky and, if I didn't pre-wash my fabric, it would shrink like crazy! Over the years, my initial love of knits never wore off, and I have learned that just a few simple changes make it easy to use the fabric that I love. For this project, Ponte knit is a fairly thick and stable fabric and thus an easier knit to work with. Before you start sewing, follow my fabric prep steps below, and play with your zig-zag seams on some extra fabric to get your stitches just right. A stretch stitch such as a zig-zag prevents the thread break when the fabric stretches. For more tips on sewing with knits, check out Dixie DIY's great and comprehensive series, Never Fear Knits. 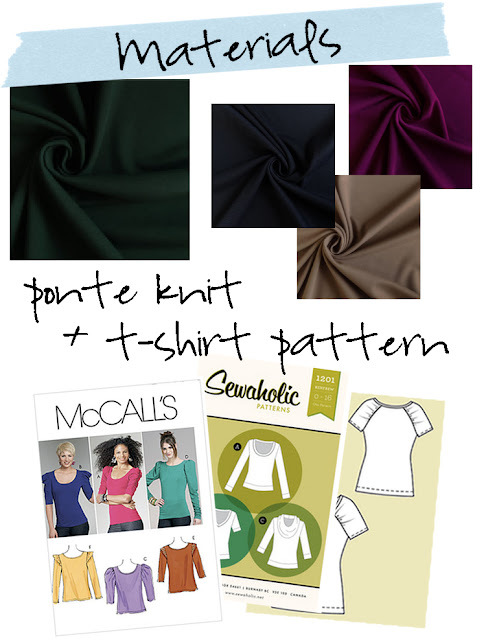 I used my t-shirt pattern block from McCall's 6164, but many people also love the Sewaholic's Renfrew Top. Or, try this downloadable one from BurdaStyle! For a tutorial on how to make your own pattern from a shirt you already own, check out Cotton and Curls's tutorial. Pre-Wash your fabric as you normally do, in hot water and dried on high so that it shrinks as much as possible. If you're particularly worried about shrinkage, you can even do this twice - I've noticed that my knit garments can continue to shrink (especially lengthwise) after the first wash.
Cut off the fabric selvages (pictured above). The strips running lengthwise along the edge of the fabric are often bound or glued and lay differently than the rest of the fabric, causing it to pucker slightly instead of lying flat for cutting. Trace your t-shirt pattern. Shorten the t-shirt front and back pattern pieces to the waistline by folding each pattern piece of your favorite t-shirt pattern 5/8" below the marked waistline. Lay these out along with the sleeve on 1/2 yard of your fabric and cut. Fold peplum fabric. 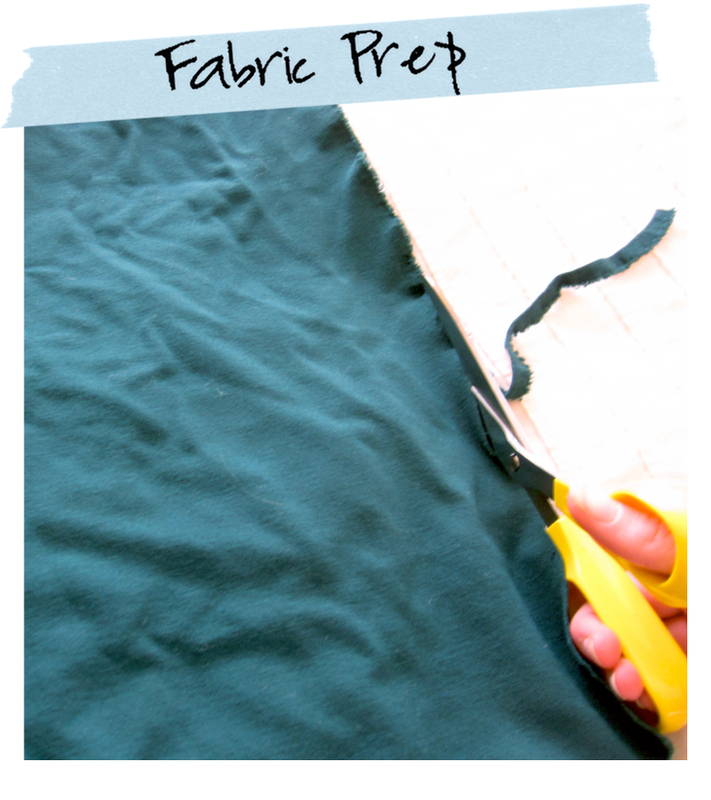 Fold the remaining 1 yd of fabric in half top to bottom and then again left to right. Your upper left hand corner should now be the center of your fabric if you were to unfold it. Calculate your peplum measurements. Measure the waist of the t-shirt pattern front and back pieces, subtracting the four seam allowances (that's minus 2 1/2" if you're using a standard 5/8" seam allowance) to get your total waist measurement. Now divide that waist measurement by 6.28 to get the waist radius (and you thought you'd never use geometry again!). Draw the peplum measurements out from the upper left hand corner of the twice-folded fabric. Just like you did in high school, hold your ruler in the upper left hand corner and trace an arced line on the fabric at the distance of your waist measurement. Now that you've drawn the waist, decide how long you want your peplum to be. Add 5/8" to the top and bottom of this measurement for seam allowance and hem, and add to your waist radius to get your total peplum length. Starting again at the top left hand corner, draw another arced line as long as your peplum length. Cut along the lines your drew, and you should have a full circle! Sew the t-shirt pieces together, following pattern instructions but omitting the bottom hem. 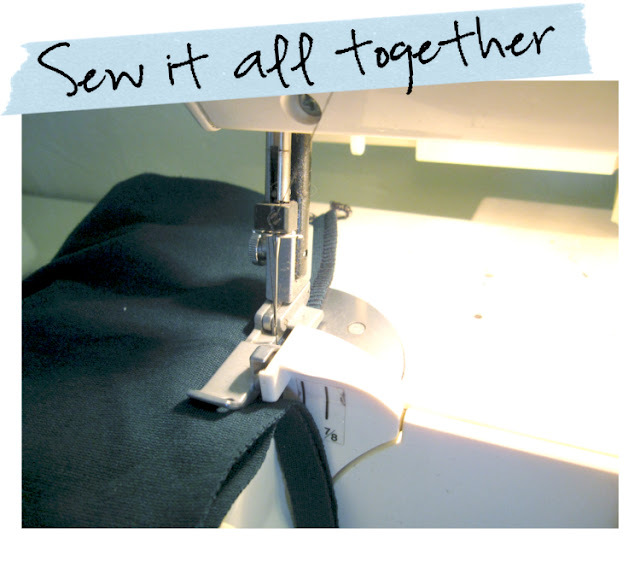 You will want to use a zig-zag stitch or overlock/serger machine so that the seam lines can stretch with the fabric. 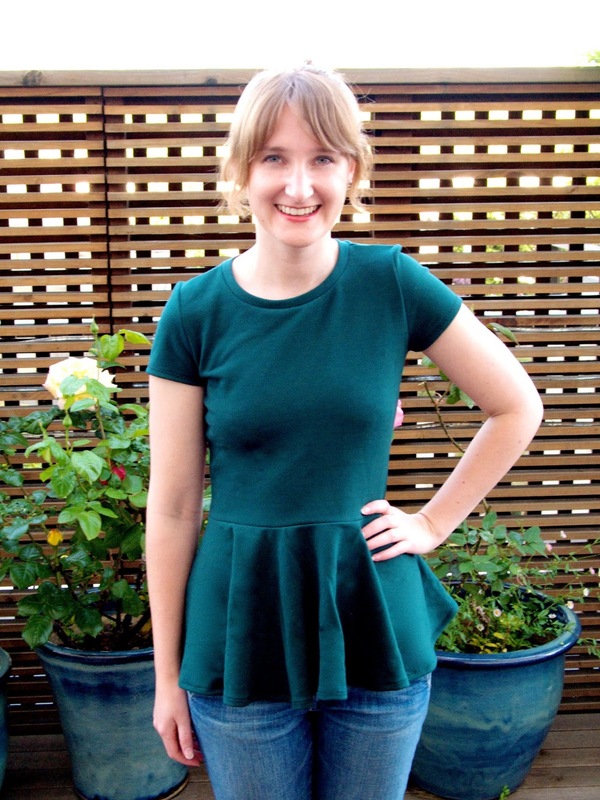 Attach the circle peplum to the top, right sides together, again using a zig-zag stitch. Hem and you're done! For tips on hemming knits, check out this post by Made by Rae. As a bonus, check out Made by Meg this week for some variations and a link party! Nice tutorial! Your top looks darling on you, Meg. The style really suits your figure. Can ponte/double knits be used in place of regular knit (e.g. jersey)? It can sometimes. It depends what you are making. If you are going to use it for a drapey flowy dress, it will not work. But I have used it for leggings already. I just went up a size for fit. Jersey knits are usually 4-way stretch while ponte/double knits are only 2-way. Just keep in mind you will not have as much stretch to work with and it will not have the same hand as a jersey or lighter weight knit.